Robyn Alders is an Associate Professor with the University of Sydney who was born and raised on a grazing property on the Southern Tablelands of NSW, Australia. 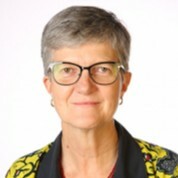 For over 20 years, she has worked closely with smallholder farmers, especially village poultry farmers, in sub-Saharan Africa and SE Asia as a veterinarian, researcher and colleague, with an emphasis on the development of sustainable infectious disease control (primarily Newcastle disease prevention) in animals in rural areas in support of food security and poverty alleviation. Robyn is the Team Leader of the “Strengthening food and nutrition security through family poultry and crop integration in Tanzania and Zambia” project funded by the Australian Centre for International Agricultural Research. Her current research and development interests include food and nutrition systems, Planetary Health, gender equity and Science Communication.